The first season of the historical drama starring Jeremy Irons is planned for Blu-ray this December. In an early announcement to retailers, Paramount will be bringing 'The Borgias: The Complete First Season' to Blu-ray on December 27. 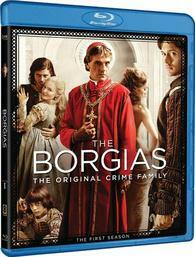 'The Borgias' is a complex, unvarnished portrait of one of history's most intriguing families...The series begins as Rodrigo becomes Pope Alexander VI, propelling him, his two Machiavellian sons Cesare and Juan, and his scandalously beautiful daughter, Lucrezia, to become the most powerful and influential family of the Italian Renaissance. You can find the latest specs for 'The Borgias: The Complete First Season' linked from our Blu-ray Release Schedule, where it's indexed under December 27.